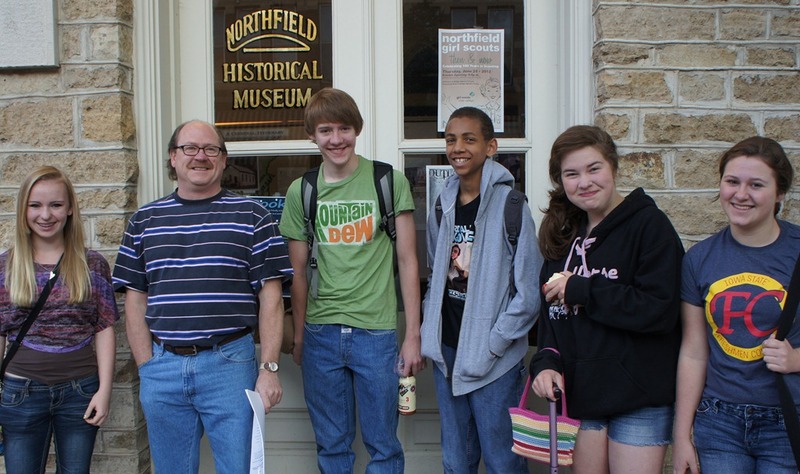 After taking photos of the CVVC riders departing Bridge Square last Saturday, I noticed Earl Weinmann standing in front of the Northfield Historical Society museum, surrounded by a gang of outlaws group of high school students. Every year, I invite the participants in the Jr. Posse Program to go to Missouri on the day after the last day of school. (The Jr. Posse are the 8th and 9th graders who go through a two month training program to become summer tour guides at the museum). In Missouri we visit the childhood home of Frank and Jesse James in Kearney. At St. Joseph we visit the Patee House (the home office of the Pony Express) and the home in which Jesse was assassinated. We also stop at an Antique Market and the 2nd highest point in Iowa (Pilot Knob Park). The trip is two days with one overnight in a hotel. This was the 20th year of the annual "Magical Missouri Tour." The purpose of the trip is for students to see the places, artifacts, and environment where the Kansas-Missouri Border War took place. They have studied and discussed these places for two months and this trip allows them to become a bit more well-rounded tour guides. By the way, the school district pays for the transportation (this year the historical society helped out with the bus payment because we needed a larger bus). This year we had the largest group ever. 23 students attended.